We offer ATEX certified fans for use in Hazardous Areas where there is risk of explosion. We offer fans certified to EN12101-3 for applications which allow evacuation of personnel from smoke filled areas. Our range of fans are classified either "F400" rated at 400 degrees C for 2 hours or "F300" rated at 300 degrees C for 2 hours. 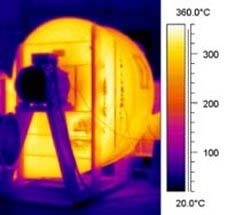 We can also offer a range of fans certified "F600" rated 600 degrees for 2 hours.